Farnborough UK, July 12, 2016 – A successful first flight test was recently completed for the C-130H (Hercules) transport aircraft upgraded by Elbit Systems for the Israeli Air Force (IAF), under an agreement signed with the Israeli Ministry of Defense. This initial flight test was the first in a series of flight tests, and future flight tests were agreed upon and will be performed in the coming months. During the flight tests, the aircraft&#39;s systems performance was tested in various modes of operation and in a variety of flight altitudes and conditions, in both day and night. The test demonstrated “out of the window” flight, in which live video was displayed on the head-up display (HUD), presenting flight and navigation data overlaying the real world by using two and three dimensional symbols, enhanced degraded visual landing applications and head tracking capabilities. Airborne refueling was also demonstrated as part of the flight tests. The IAF pilots were impressed with the new capabilities, and the feedback was positive. They emphasized the contribution to flight safety of the new configuration and the enhanced situational awareness gained in different phases of the flight. They also noted the reduced workload and the improved cockpit communication due to flight in “head out” orientation. The modernization project, which began in 2012, extends the operational life of the aircraft and significantly improves its operational capability, particularly in precision flying, low-level night flight and operations in adverse weather. The modernization not only contributes to improved flight safety but also reduces operating costs by introducing cutting-edge digital systems to replace obsolete analog systems that have become unreliable and costly to maintain after four decades of intensive service. Elbit Systems&#39; airborne platform upgrade programs utilize systems, subsystems and applications being deployed on the most advanced platforms, both military and commercial, in order to meet current operational needs and enable integration of future operational and technology capabilities. The first sorties of the upgraded C-130 were reported in October 2015 by the official IAF magazine. During those flights, Colonel Ariel Manor, the Head of the Aircraft Engineering Department, said: &quot;The IAF is basically receiving a new aircraft&quot;. The improved planes will possess significantly upgraded operational capabilities, especially in the field of low altitude flight and flying in dark nights. In January 2014, Elbit Systems announced that it was awarded a follow-on contract to supply the IAF with additional C-130H capabilities which will allow the aircraft to meet the stringent international CNS/ATM (Communications Navigation and Surveillance/Air Traffic Management) standard and operate in commercial airspace. In December 2012, Elbit Systems announced that it was awarded a contract by the Israel Ministry of Defense to upgrade the IAF’s C-130H (Hercules) transport aircraft. 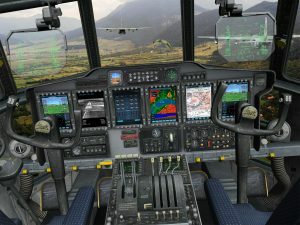 Upgrade of the Korean Air Forces&#39; C-130, in which the Company installed various types of advanced electronic systems and also converted the existing analog cockpit into a &quot;Glass-Cockpit&quot; using Elbit Systems&#39; cutting- edge digital flight displays. Upgrade of the Romanian Air Forces&#39; C-130 transport aircraft, in which the Company installed various types of advanced electronic systems, including those produced by Elbit Systems EW and SIGINT – Elisra. The project was executed in cooperation with local companies in Romania, led by the Romanian aeronautical industry. The Brazilian Air Forces&#39; C-95 freighter-wayfarer aircraft has also been upgraded by Elbit Systems&#39; Brazilian subsidiary AEL Sistemas S.A.. The program includes integration of advanced avionics such as digital maps, displays, advanced communication and navigation systems and additional advanced systems, aimed at improving the aircraft&#39;s performance and the pilot&#39;s survivability. 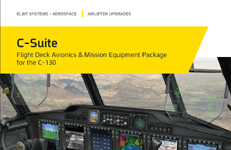 These new, cutting edge avionics systems meet the high standards of newly manufactured aircraft, specifically in flight safety and mission performance in harsh weather conditions. Elbit Systems recently announced collaboration with Northrop Grumman for the development of Terrain Following and Terrain Avoidance (TF/TA) System to Improve Tactical Low-Level Flight Safety for Military Transport Planes. This innovative system will enable pilots to fly and maneuver more safely in Terrain Following/Terrain Avoidance (TF/TA) flight mode under all weather conditions, day and night. Under the collaborative development, Elbit Systems’ TF/TA head-up display (TA/TF HUD with real-time video capability) application is coupled with Northrop Grumman’s AN/APN-241 Terrain Following Radar for an avionic upgrade for existing or new C-130 Hercules transport aircraft. The TF/TA HUD demonstrator is expected to fly within the upcoming year on an international customer&#39;s C-130 Transport Aircraft. The TF/TA system relies on a Digital Terrain Elevation Database and the Terrain Following Radar as an active sensor, driven and controlled by Elbit Systems’ Smart Displays. Implemented as part of a &quot;Glass Cockpit&quot; concept, the system is positioned as a competitive and attractive enhancement for C-130 modernization and upgrading. The system evolved in Elbit Systems’ Futures Lab, the Company’s innovation center tasked with rapid prototyping and proof of concept evolving aerospace systems. The TF/TA system has already been selected for integration into an ongoing C-130 upgrade program. Northrop Grumman’s AN/APN-241 radar has been selected as the standard radar for the Lockheed Martin C-130J Super Hercules and Alenia C-27J transport aircraft. Additionally, the AN/APN-241 radar has been integrated and installed on the CASA C-295 transport aircraft.